If you have a child entering the school system for the first time this year, you might want to dig out his or her record of immunization. In some provinces — including Ontario, New Brunswick and Nova Scotia — you may have to provide proof that your child has been inoculated against diphtheria, tetanus, polio, measles, mumps and rubella. In Manitoba, you may have to provide proof that your child has been protected against measles. Five-year-old Rylee Hanson receives one of her required vaccines before she can enter kindergarten in Minnesota for the 2008-09 school year. ((Steve Kohls/Associated Press))If you have a child entering the school system for the first time this year, you might want to dig out his or her record of immunization. In some provinces — including Ontario, New Brunswick and Nova Scotia — you may have to provide proof that your child has been inoculated against diphtheria, tetanus, polio, measles, mumps and rubella. In Manitoba, you may have to provide proof that your child has been protected against measles. Hemophilus influenza Type B disease. All provinces and territories pick up the tab for these childhood vaccinations. In addition, girls and women between the ages of nine and 26 can get immunized against the human papilloma virus at no charge. The series of shots is offered through most schools across the country. Vaccines work by helping a child's immature immune system to build resistance to diseases. Some redness, swelling or pain at the place where the needle went into the arm or leg is the most common vaccine side-effect. 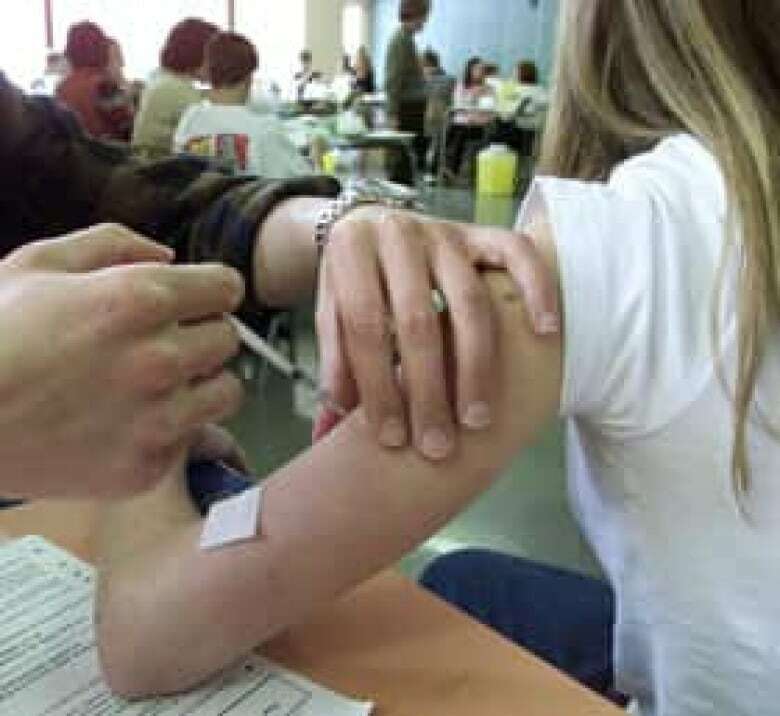 Some children may develop a fever after a vaccine. Children with severe allergies to eggs should only be given a flu vaccine under close medical supervision. Flu vaccine is normally developed in chicken eggs. Allergic reactions to vaccines — such as breathing problems, severe swelling of the skin or mouth - are rare. Talk to your doctor before the next shot. If your child is very sick when it's time for a vaccine, talk to your doctor. Vaccines contain tiny amounts of dead or weakened virus or bacteria that activate the immune system without causing a disease. When a child is vaccinated, his or her immune system is prompted to produce antibodies against the invader. The immune system stores information about how to make the antibodies. If vaccinated children are later exposed to the disease, their immune systems can rapidly make protective antibodies. No vaccine is completely safe or effective, but the routine immunizations do prevent diseases with extremely low risks of serious side effects, according to Health Canada. Children may have some swelling or tenderness where the vaccine is injected, or may temporarily develop a mild fever. Serious side effects such as severe allergic reactions occur less often than one per million doses, the department said. People who are vaccinated also help protect others who cannot have the shots because of allergies or other reasons. The immune system's memory lasts for life, but the response may go down slightly with time. That's why boosters or repeated boosters are given, to help increase the intensity of the response. The national advisory committee also recommends giving the diphtheria, tetanus, acellular pertussis vaccine, also called DTap, between the ages of 14 to 16 years. The Public Health Agency of Canada also recommends influenza vaccine for all children six months to 23 months of age. Complete guidelines on when to immunize your child can be found on the Public Health Agency of Canada's website. Vaccines have all but eradicated diseases like mumps, measles — in the developed world — and rubella. An Afghan baby receives a polio vaccination during a house-to-house polio immunization campaign in Kabul. 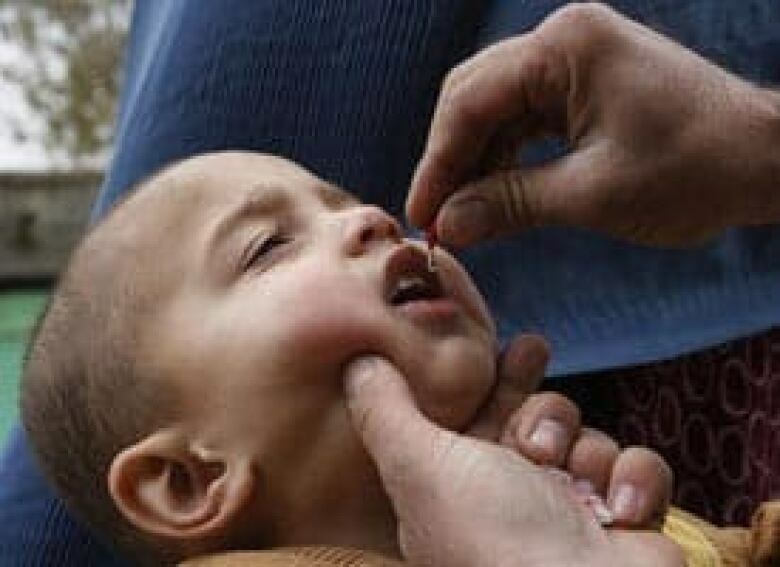 Polio is still a problem in parts of the developing world. The Americas were declared polio-free in 1994. ((Musadeq Sadeq/Associated Press))However, when immunization rates have dipped in other developed countries, diseases have returned. After immunization rates for whopping cough fell in Britain in 1974, an epidemic of the disease killed 36 people in the country three years later. The 2002 National Immunization Coverage Survey estimated less than 76 per cent of seven-year-olds had their two recommended doses of measles vaccine, although coverage rates were not available for all provinces and territories, and were measured differently across the country. There have been outbreaks of mumps and measles in Canada in recent years, generally blamed on the failure of kids to get that second recommended dose of vaccine. In 2007, an outbreak of hundreds of cases mumps that started in Atlantic Canada quickly spread to central and western parts of the country. The outbreak mainly hit college and university students. In 2008, the U.S. Centers for Disease Control and Prevention found that the number of reported cases of measles had hit levels not seen in a decade. More than half the cases were reported in children whose parents rejected vaccination due to fears that it's linked to autism. Those fears were fuelled by a British study of 12 children that was published in 1998 in the Lancet. No other study since then has replicated those results. Most of the authors of the original study have disavowed the findings. On Feb. 2, 2010, the Lancet published a retraction, saying the study should never have been published. "It has become clear that several elements of the 1998 paper … are incorrect," the Lancet said in a statement. In provinces where it's mandatory for a child to be vaccinated, parents can secure an exemption — usually by producing a notarized document saying their child won't be immunized for religious, philosophical or medical reasons. The Public Health Agency of Canada recommends all children be vaccinated, except for children with certain types of cancer or children with a disease or on drugs that lowers the body's ability to resist infection. You should also weigh the pros and cons of continuing with a series of shots if your child has had a serious reaction to earlier shots in the series. Most vaccines are delivered by injection — a painful procedure that horrifies many kids and adults alike. Trypanophobia — the extreme fear of hypodermic needles — is one of the most common phobias that plague people. A nurse administers a meningitis vaccination in the cafeteria at Massey Vanier High School in Cowansville, Que., on Feb. 26, 2001. Three thousand students and staff were vaccinated after four students were hopitalized the week before with meningitis. ((Paul Chiasson/Canadian Press))According to Canadian researchers, it's possible for parents and medical professionals to help manage that pain so needles aren't as scary a prospect for most kids. Researchers at Toronto's Hospital for Sick Children, the University of Toronto, Dalhousie University, the University of Western Ontario and Mount Sinai Hospital in Toronto analyzed data from 71 studies involving 8,050 children to determine the best physical, psychological and pharmacological strategies to minimize vaccine injection pain in children. They published their findings in the August 2009 supplement of the journal Clinical Therapeutics. Stay calm and maintain a positive atmosphere; actions and words can influence the child's reaction. Take your child's attention away from the procedure by using distractions such as toys, slowing down breathing by having the child blow bubbles, or telling jokes. Provide physical comfort, like hugs. Put a topical anesthetic on the site of injection or give a sugar solution, particularly for newborns. "If we can teach parents from the start to help manage their child's pain, we can go a long way toward reducing the lifetime burden of pain," Taddio said. Meanwhile, another study suggests that infants who receive routine vaccine injections in a certain order during a trip to the doctor seem to experience less pain. The researchers found that giving the least painful shot first helped reduce the pain kids felt. Pain was reduced in infants who received the pneumococcal conjugate vaccine (PCV) following the combination vaccine for diphtheria, polio, tetanus, pertussis and hemophilus influenza Type B (DPTaP-Hib), Dr. Moshe Ipp of Toronto's Hospital for Sick Children and his colleagues reported in the May 2009 issue of the Archives of Pediatrics & Adolescent Medicine. "We recommend that the order of vaccine injections be the DPTaP-Hib vaccine followed by the PCV," the study's authors concluded in the study. In 2010, a nasal spray version of the flu vaccine was approved in Canada, offering a needle-free approach for people two to 59 years of age. The Public Health Agency of Canada said in July 2010 it would review evidence on its safety and effectiveness. The agency will then issue recommendations to provinces and territories to consider when deciding whether to provide the nasal spray vaccine. The vaccine may cost two or three times more than the traditional flu shot, Nova Scotia's chief public health officer said.